Canadian Feed The Children’s Africa Regional Program Manager, Amboka Wameyo and new Monitoring & Evaluation (M&E) Manager, Faisal Islam, have travelled to Ethiopia and will soon be reporting back on their adventures visiting CFTC communities and local partners. This is an important visit for a number of reasons. 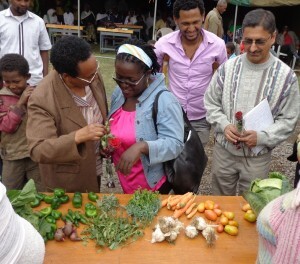 Amboka Wameyo (in pink) and Faisal Islam (on right, with rose) inspect the produce of some of the ISAPSO women’s self-help group producers. Having Faisal on board as our M & E Manager (he joined us in late March, 2013) is an exciting stepping stone for CFTC, coming on the heels of a number of recent governance milestones, including last week’s Imagine Canada accreditation; early February’s VSRA Excellence in Financial Reporting Transparency Award; and the late 2012 notification we received of the largest CIDA grant in CFTC’s history – a $2.4-million climate change project that will boost the resilience of 750,000 women and men smallholder farmers in northern Ghana to climate change impacts. Faisal’s role is to help us take our monitoring and evaluation practices to the next level as we strive to deepen our capacity to report our measurable impact on the community development work we are supporting around the world. 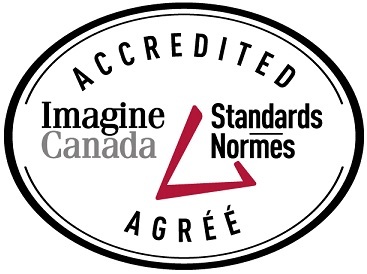 This capacity is what the Imagine Canada accreditation is all about: an assurance to our donors that CFTC meets the highest standards in governance of the non-profit sector. It is precisely these governance structures at CFTC – which Imagine, VSRA and CIDA have recognized – that will enable us to report our results in a real and meaningful way to our donors. This is all part of a growing conversation that is occurring with more frequency these days, which shifts the focus towards more meaningful ‘metrics’ of impact as the best indicator of a charity’s competency and capacity, and away from what is being termed the “overhead myth” of solely focusing on ratios. That’s exactly why hiring a Monitoring & Evaluation specialist, like Faisal, is so extremely important, and why I’m very much looking forward to what he has to say as he takes his first trip with CFTC to Ethiopia to work with our local partners and CFTC staff. Until then, we will be sharing a few fun and informative updates from Amboka and Faisal, who visited our local partner CHADET on the Day of the African Child (June 16th), and came away feeling very inspired!